It is cliched, as Half Man Half Biscuit once observed, to be cynical at Christmas. But it’s hard to stifle thoughts of murder as you traipse around the shops listening to the same twenty tracks over and over again. Take Paul McCartney’s ‘Wonderful Christmas Time’ and listen closely, if you can bear to – it’s the sound of thinly veiled misery, of pretend joy spat through gritted teeth. The guy’s clearly waiting for Boxing Day to serve the divorce papers and walk. Elsewhere, Whamaggedon is now a massively multiplayer survival game that runs on social media through December. Half my mates are already in Whamhalla awaiting my arrival. The solution then? Well, I’d argue that there are loads of great Christmas records, but you have to make the effort to seek them out. Soul and hip-hop present a rich vein of quality festive music, as, weirdly, does indie rock. Low have a lot to answer for there, even if Low Christmas isn’t successful as a complete package of songs. Because here’s the thing – there are very, very few really great Christmas albums. It’s a tinsel encrusted rock on which even the Beach Boys and Bob Dylan have run aground, and then the best examples are largely made up of traditional songs and covers. I’d recommend Johnny Cash’s simple and moving 1963 LP ‘The Christmas Spirit’ or the unexpected and deadly earnest ‘Mark Kozelek Sings Christmas Carols’ from the misanthropic Sun Kil Moon frontman. 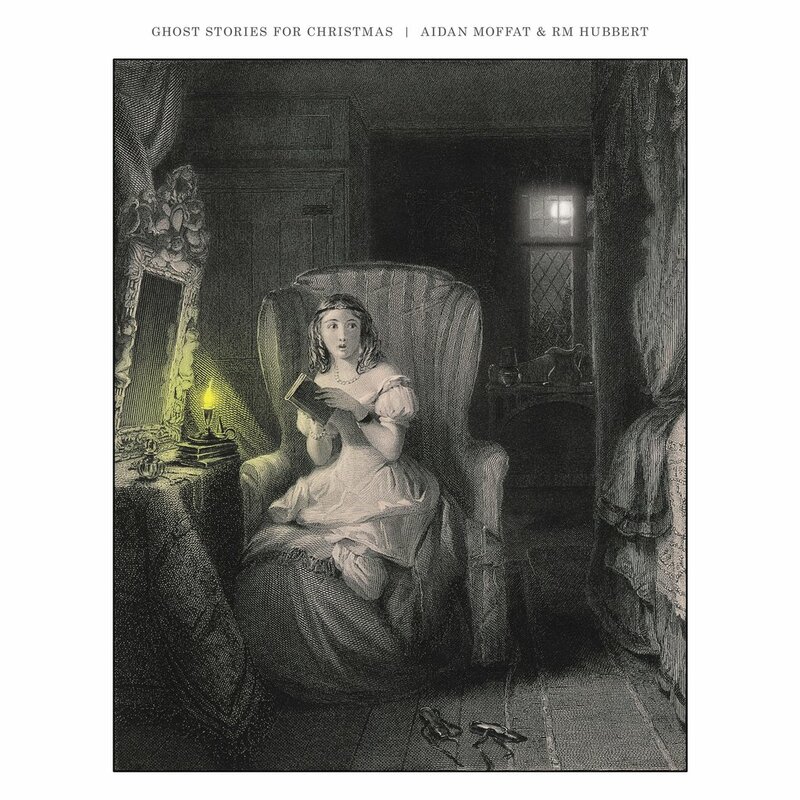 So I’m pleased to report that ‘Ghost Stories for Christmas’ by Aidan Moffat and RM Hubbert is not only a worthy follow up to their excellent ‘Here Lies the Body‘, but is also a festive banquet of a record that should have a place in all your Christmas stockings this year. It’s out this Friday and they’re taking it out on the road in a series of live shows from next week. Which is not to say that it’s exactly cheerful. This is a record about ageing and loss, and about the wisdom that comes with that. The title track might enjoin us to deck the halls with love, but the lovers have been parted, and at first it’s not entirely clear that they haven’t been parted by something more permanent than a break up: “She floats around the front room / and she hovers in the hall” and as she looks through the cards and decorations asks, “how can absence fill a room? / how can nothing hang so heavy? / how can it hurt? / how can it loom? / and can you keep it up for just one day? / the bogus joy, the deft display / you’d better watch out / and you’d better not cry.” Santa Claus is coming to town, and it feels like an inescapable sham. And it also doesn’t, because the Christmas ghost story as a genre also serves to remind us to live for the day and enjoy our fleeting lives. So ‘A Ghost Story for Christmas’ segues from its “silent night in bleak midwinter / getting drunker getting skinter” into the syncopated arpeggio of ‘Desire Path’, which riffs on the theme of dashing through the snow to be with your loved ones and into ‘Weihnachtsstimmung’. This lists the various names of Christmas and the simple unpretentious pleasures of the secular holiday season – the mulled cider, the cuddles and the promise of an hour with Doctor Who. But there’s a ghostly old man haunting the children via the family mirror in ‘Such Shall You Be’, and he’s laughing. It’s a chilling thought so let’s face the facts: Christmas gets hard as you get older. It becomes as much about who isn’t there than who is, and sometimes you need reminding that there’s always some new opportunity to love. Aidan Moffat is the ideal guide for this kind of expedition. He’s been an unrelenting master of suspense since the early days of his band Arab Strap and his powers of storytelling are unmatched. Whether he’s reworking Hans Christian Anderson’s bitter little fairy tale ‘The Fir Tree’ or has his protagonist sat in a bar pondering his lonely fate in an ‘Ode to Plastic Mistletoe’ he keeps his audience guessing and hoping for some twist. The joke has always been that you never quite get to the hoped-for payoff, but he conveys a warmth and humanity even when the punchline is the cruel promise from a mouse to the old Christmas tree that “You’ll soon be warm enough”. There’s a couple of well-chosen covers – an unspeakably bleak rendition of Mud’s ‘Lonely This Christmas’, and a show-stopping, stripped-back version of Yazoo’s ‘Only You’. Moffat and Hubbert’s take on Vince Clarke’s masterpiece is totally precise. There’s not a note or a breath that isn’t absolutely necessary and it makes the cold ache of the original sound extravagantly bloviated with detail in comparison. Indeed, throughout the album Hubbert’s flamenco inflected guitar work is exquisite. Where the Yuletide song is stereotypically about more, just more, he’s stepped back and written music steeped in Christmas, but without simply throwing half a ton of glitter at it. The album ends with a few words from Charles Dickens extolling us to dwell not upon the past: “Never heed such dismal reminiscences,” he advises us in his playful Scots brogue. “There are few men who have lived long enough in the world, who cannot call up such thoughts any day in the year. Then do not select the merriest of the three hundred and sixty-five for your doleful recollections, but draw your chair nearer the blazing fire – fill the glass and send round the song.” It’s the perfect conclusion for a record that understands that doleful recollections are the very stuff of Christmas, and that we need our midwinter’s feast precisely because of our doleful recollections. Whatever your Christmas finds you doing, putting a brave face on your despair in the bosom of your family, or savouring your glass of reeking punch with no one but sad memories, Ghost Stories for Christmas makes an excellent companion.